I confess I am not a big fan of mysteries set among the rich and famous. The eccentricities get old after awhile and I find I relate so little to the characters. But the idea of reading a mystery featuring a bookseller appealed to me, so I took a chance on Judi Culbertson's An Illustrated Death. I had not realized this was the second book in the series, otherwise I would have started with the first book. Not that the reader needs to. As with many mystery series, this book stands well on its own. It's just that with only one book before it, I could easily have slipped the first book in. An Illustrated Death was an enjoyable read. It has a cozy feel to it with an amateur sleuth and a small town setting. The main character and I hit it off right away. Delhi seems like the kind of woman I wouldn't mind sitting down to lunch with, and not just because we are both book lovers. Although that helps. Delhi seems down to earth and like an all around nice person. The Erikson family isn't short on eccentricities and they really aren't all that likable. I felt sorry for Bianca, who lost her daughter, but she had an edge about her that was hard to get past. Still, the author has created an interesting story around them, secrets that aren't easily guessed--and boy, are there a lot of them! I did enjoy the periphery characters, who I imagine are regulars in the series, especially Marty and Susie, both of whom I hope to see more of in future books. I'm also really curious about the more personal story introduced in this novel relating to Delhi and one of her children. Having not read the first book in the series, I do not know if the subject came up there, but it's certainly a hanging thread left at the end of An Illustrated Death that will be interesting to follow as the series continues. Be warned, this personal side story has the distinct smell of a cliff hanger, even though it's not directly related to the main mystery in An Illustrated Death. An Illustrated Death is a fast read, one that would be great for a quiet fall or winter afternoon. There's humor and heart mixed in with a good dose of suspense. I wouldn't mind reading more by this author. 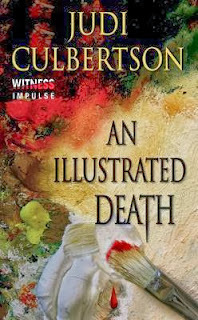 You can learn more about Judi Culbertson and her books on the author's website. Source: Review copy provided by publisher via Edelweiss. An Illustrated Death sounds like a good one. I can enjoy amateur sleuths and small town settings. The rich and famous characters could get grating as I can't relate to them myself either, but this one sounds well written! Naida - "Grating" is a good word to describe how those types of character make me feel sometimes. I did think this book was well written and think I'll look for more by this author in the future. Sounds like one I could enjoy. But I hate cliff-hangers, even if they're not the main mystery story-line. Carol - And this cliff hanger was kind of a biggie. Even given it was a side story line. I think it might frustrate many who aren't fond of endings that leave you hanging. A bookseller and an artist, a wininng combination. That cover makes me want to pick it up and delve right in. Thanks. Heather - I thought so too! If you do read it, I hope you will enjoy it! Sounds one I too would like. Thank you for the post. Mystica - I enjoyed it and hope you will too if you decide to read it! This sounds like a good read and it fits in perfectly with the fact that I've been in the mood for a good cozy mystery or two! In fact, I just grabbed one at the library and then a bunch more from my local thrift shop. This one is going right on to my TBR list (but I think that I will start at book one. LOL!). Samantha - Sometimes a cozy is just what we need!